Product Description ELx50 8-Well Strip Washer. Programmable instrument, the ELx50 allows for full control of precise fluidic delivery from the gentle dripping of a simple squeeze bottle to the full force of pressure delivery systems. In 96-well format, the Dual-Action manifold provides incomparable wash performance with two sets of dispense and aspiration tubes per well. This exclusive method of two-fold aspiration guarantees low residuals. 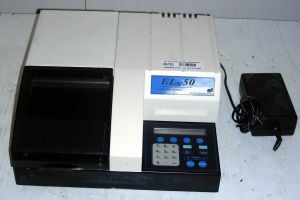 This ELx50 Auto Strip Washer is the perfect solution for low volume users of 96 well microplates. Variable Fluid Flowrates 150 to 1000µL/well/sec. Soak Times 1 to 600 sec. What is your application ? What are your specifications ? We have over 4000+ items in stock! or Click Here to email us for your equipment and laboratory supply needs.